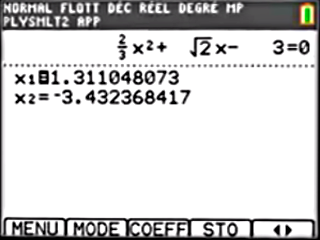 Thanks to the keen eyes of the French calculator community, we discovered a lot more about the probable features of the TI-84 Plus CE, thanks to TI Education France's release of information about the TI-83 Premium CE. We have long seen TI Education France's propensity for what we'll charitably call creativity with handheld names: the TI-83 became the TI-82 Stats.fr, the TI-84 Plus Silver Edition became the TI-83 Plus.fr, and they even dropped the ubiquitous "Plus" in Flash-based models' names to designate the tiny TI-84 Pocket.fr. Therefore, we are all but certain that the TI-83 Premium CE is simply a re-branded TI-84 Plus CE, from the HP Prime-esque thin-and-light case design to the USB-only connectivity. Thanks to TI Education France's released information, we can now tell you a great deal more about the TI-84 Plus CE. Archive/ROM: 3.5MB, likely indicating the calculator has the same 4MB of OS-accessible Flash as the TI-84 Plus C Silver Edition. Vernier's information continues to indicate 3.0MB. RAM: 154KB user RAM. This suggests either banked user RAM, a la the TI-86, or a new 24-bit (ez80) or 32-bit (ARM) processor. Graphing Features: Similar to TI-84 Plus C Silver Edition. 10 functions, 6 parametric functions, 6 polar expressions, 3 sequential functions. 15 possible line colors, images usable as graph backgrounds. 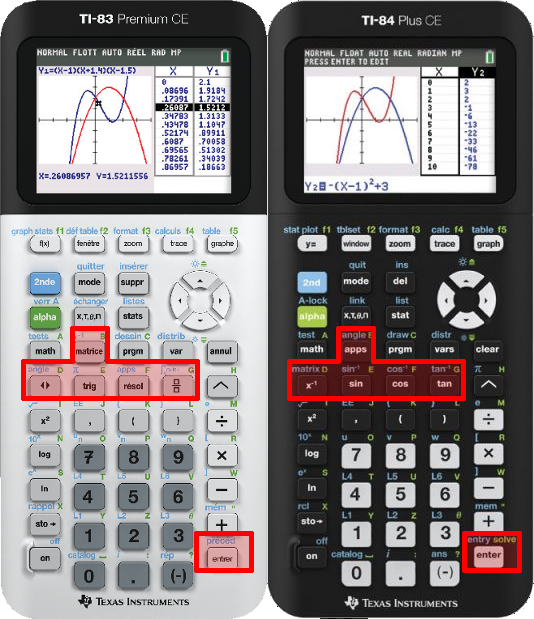 Math Features: The same matrix, list, statistics, complex number, probability, finance, and math functions available on the TI-84 Plus C Silver Edition. Standardized Tests: Allowed on the SAT, ACT, IB, AP, and presumably other standardized tests. Programming Features: Supports both Assembly and TI-BASIC programming. Preloaded Apps: Polynomial Root Finder and Simultaneous Equation Solver, EasyData 5.0, Cabri Jr, CellSheet, Conic Graphing, Inequality Graphing, Probability Sim, Transformation Graphing. We also know that there will be a new version of TI-Connect, to be called TI-Connect CE, along with OS 5.0 for the TI-84 Plus CE and EasyData 5.0 to support Vernier hardware. As always, please weigh in in the attached topic. We expect to have official word from Texas Instruments with more information in a week or two, if possible, but for now, let the rampant speculation continue! Video of TI-83 Premium CE in the classroom at Lycee Rosa Parks de Montgeron, France. Anyone know someone from the video? . Either way the tech specs are interesting so far. I wonder if PaD has one yet? Did I see Eeems? Good video there, the french one. Eeems is Canadian, not French. Our French friends are Adriweb and Lionel Debroux, neither of whom is in the French equivalent of high school. I see that the video overviews of the TI-83 Premium CE and the TI-84 Plus CE are now private rather than unlisted. Sorry about that, TI! I didn't mean to jump the gun on whatever plan they have for rolling out information on these calculators. Yes, good spotting on the lack of a link port, tr1p1ea, although I was already pretty convinced from Vernier's information on Tuesday. Based on the current evidence, I'm strongly inclined to think that we're dealing with an ez80 or similar rather than an ARM emulator. 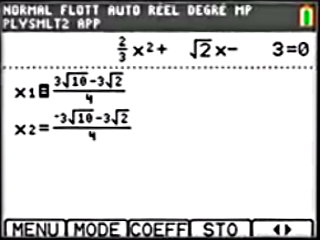 Edit: Oh, the TI-83 Premium CE video is still live; it's just the TI-84 Plus CE one that's private. It's a bummer i missed the 84 Plus CE video, but around 1:35 into the 83 CE video you can see that the menus are much faster. Graphing also looks faster but still quite a bit slow. EDIT: Also, what could the difference in Archive memory be due to? You assume it's not just a sped-up video to show the features for marketing reasons. As far as I can tell, the non-live-action videos are just a series of screenshots presented on the rendered calculator's screen as fast as the video's designer decided was appropriate, so I'm not putting too much stock in that. And well, a calc from the 83/84-named series with a CAS would be crazy, even with TI's weird naming habits. at Lycee Rosa Parks de Montgeron, France. are now private rather than unlisted. The fact that the calc is allowed on the ACT proves that it has no CAS functionality because all forms of a CAS-equipped calculators are banned. Handling certain return values specially doesn't require a CAS. Indeed, I said "CAS-like" hoping to get across the idea that it performs some intelligent processing of the input, rather than just collapse it down to a single value. If the correct term for that is an "exact math" engine, then so be it. How do you know that the 84+CE doesn't have it? The day-to-day usage of the exact math engine is based on the specific "<>" key, known from the TI-Collège Plus. The 84+CE doesn't have this key, as shown by the above pictures. The day-to-day usage of the exact math engine is based on the specific "<>" key, known from the TI-College Plus. Fascinating. I wonder if there's an OS difference, and if there's anything that would prevent such features from being used on the English edition. Anyway, I was thinking about what sort of tests we could have somebody with a test unit run to give us an idea about what CPU there is. So here are some test programs that can be run to figure out if it's a Z80. This test attempts to determine if a very basic Z80 opcode works. Expected output: Program returns immediately without any apparent output. This program tests more complicated Z80 opcodes. It screws with a bunch of RAM, and then fixes it. Expected output: Program returns immediately without any apparent output. If it crashes, the it's not a Z80 and there's no point in the rest of the tests. Test 3: Is it a Z80 at 15 MHz? This test attempts to approximate the CPU speed the program is running at. If it's still the same Z80 CPU and still running at the same clock speed, then the test will take a really long time. But, if it's a different Z80-compatible CPU, or it's a Z80 at a much higher speed, then the test won't take very long. If it's a Z80 at 6 MHz (OS 4.0 defaults to 6 MHz for asm programs and apps), then nothing will happen for over a minute, and then prgmA will display a number near 78-79. If it's a Z80 at 15 MHz, then nothing will happen for half a minute, and then prgmA will display a number near 31-32. If it's a Z80-compatible CPU, then it may display a much smaller number. Or not. Test 4: Is it a faster Z80? Is it a Z80-compatible? This test attempts to differentiate between a Z80 CPU and more advanced, pipe-lined Z80-compatible CPUs. It does so by looking at the difference in execution time between two different loops. In an un-pipe-lined CPU, the second loop version will take about 50 % longer than the first (that is, the ratio between the first and second execution times will be about 2:3). In a pipe-lined CPU, the difference will be smaller (that is, the ratio will be closer to 1). Run prgmA. Expected output: Program will wait a while, display a number, then wait again, then display a second number. Record these two numbers. If it's a Z80: The ratio between the two numbers will be between .62 and .71, provided the first number is at least 20. If the ratio is less than .62, it's a WTF. Test 5: Does it have MLT? If there is MLT: The program will return almost immediately without any apparent output. If there is no MLT: The program will pause for whatever time the first number in test 4 was, and then return without any apparent output. Test 6: Is it the same video driver? Expected output: The screen should flash a sort of pink color, or some sort of color. If it doesn't, or you don't catch the color, try appending the contents of prgmB or prgmC from test 4. Test 6: Are there multiple CPU speeds? Run prgmA, and write down its output. Then, edit the second line of prgmB from 3E00 to 3E01, run prgmB again, and write down its output. Test again with 3E02 and 3E03. Thanks for writing these test programs, DrDnar. If I happen to get my hands on a TI-84 Plus CE before the calculator's official release, I'll definitely do my best to do some sleuthing. If anyone else out there happens to have a TI-84 Plus CE or a TI-83 Premium CE (critor, perhaps? ), then testing those and posting the results here would also be helpful. Apparently, it's a moot point, because Critor said it's an eZ80. Well, the LCD test and CPU speed tests should still be considered. Yeah I just saw the TI-Planet article now and was surprised. I was sure this would be an ARM machine running some emulator. At least it's much more adequate than a 15 MHz Z80 for screen refreshing. I am curious how well ASM programs will work? I know some CSE APPs will be available for the calc, but will stuff such as hardware scrolling and 160x240 still work? We all know that on the TI-Nspire 84+ emulator, hardware scrolling (z-adress) didn't work. It appears to be exactly the same LCD. It's likely that LCD routines and techniques will not have to change at all. ez80? Im ecstatic! I wonder when someone will get their hands on one? © Copyright 2000-2019 Cemetech & Christopher Mitchell :: Page Execution Time: 0.361735 seconds.